- 104 Coach class seats in an extremely low density arrangement at a generous 107cm (42ins) pitch. 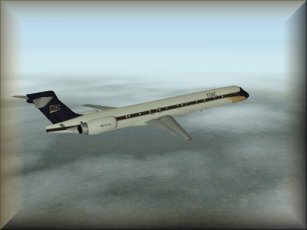 The MD-90 first flew in 1993 and is part of the DC-9 family of aircrafts that has evolved over time into the MD-80 series and, with the merger of McDonnell Douglas and Boeing on 4th August 1997, into the Boeing 717. Certification was awarded on November 16th of the following year. The MD-90 offered improved operating economics and reduced environmental impact over the MD-80 series through use of the IAE V2500 engines which feature reduced emissions and noise levels. Further advances were made to the Flight Management and Electronic Flight Information (FMS and EFIS) systems and refinements were made to the cabin interiors and the aircraft features a 1.4m (4ft 6in) fuselage stretch forward of the wing over the MD-80 series to compensate for the additional weight of the rear mounted engines. The first deliveries took place in 1995 with aircrafts having gone to SAS (8) and Delta (16) as well as European Overseas Airways (50) and European Overseas Americas (16). Other major operators include JAS (16) and Saudi Arabian Airlines (29) European Overseas have taken delivery of 50 MD-90-30 and 4 MD-90-30-ER aircrafts to date with a further 4 expected by the close of 2001. EOAmericas have also received a total of 16 of the MD-90-30. All of the European Overseas aircrafts have been refitted according guidelines set down by EOAC regarding seating arrangements. 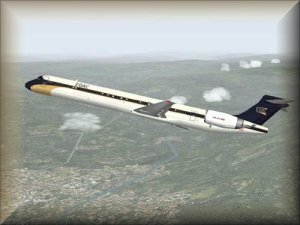 The EOAC MD-90 aircrafts are fitted out for 14 Business Class and 94 Coach class in an extremely low density arrangement. Business Class passengers enjoy a seat pitch of 152cm (60ins) while Coach Class are guaranteed a generous 107cm (42ins). As on all EOAC flights, passengers may also accommodated at the bar for much of the journey and a meal is served on all flights. ...McDonnell Douglas had really received orders for a further 74 MD-90-30 from a single large airline? It probably would not have been anywhere near enough to halt the Boeing merger but it would have kept production going at least until 2002. Boeing would possibly have considered continuing to take orders for the MD-90 although this would have interfered with sales of the stretched next generation 737. In all probability it would only have extended the production.